Often dull and overly complex, there’s occasionally some decent stuff here, but it takes a lot of sorting through the garbage just to find it. The Two Jakes is a bit of a mess. 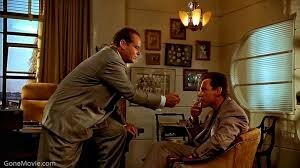 on the one hand, it is meant to be the sequel to Chinatown, and in many ways it really does feel like it. but on the other hand, everything that Chinatown stood for seems to go right out the window here. the plot is so overloaded, so complex, that it’s nearly impossible to follow. Chinatown kept things simple until it’s twists started rolling out. But by that point we were so involved in the story that they were all easy to comprehend. the same cannot be said about The Two Jakes. 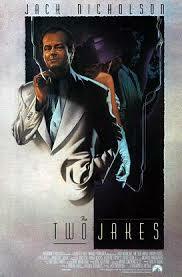 The movie starts with Jake Gittes (Jack Nicholson), being hired by Harvey Keitel to find out if his wife is cheating. Same idea as how Chinatown began with Evelyn Mulrae (Faye Dunaway) hiring him to do the same thing. only here, it’s not as simple as following a guy and taking pictures. Instead of that working out smoothly, Keitel’s character, Jake Berman (the other Jake), busts into the room where his wife is sleeping with another man and kills the man. turns out the man were his business partner. and now that he is dead, Berman inherits a lot of the company. so by killing this man, he was moving ahead in business. That raises suspicions that maybe the murder wasn’t about the wife, and even that maybe the wife sleeping with this partner was a setup. Maybe the wife was in on his murder. All of this sounds pretty intriguing, but it’s as far as the movie goes. And just to dig that out, there are so many characters, names, and misunderstandings to deal with. there’s also the name Mulwray, which comes up on a wire recording of the man who was killed as he was sleeping with berman’s wife. Why this man would mention this name at this time is beyond me. And what she has to do with anything is another question. The name Mulwray connects this movie to Chinatown. Giites revisits some of the things that happened in that movie in his head, and at one point he even reads a letter from Evelyn and we hear the voice of Faye Dunaway reading it to us. normally I like when sequels mention the films that came before to show that they are in the same world, but here it seems to do it just to do it. I don’t even understand what this mulwray daughter has to do with anything. Aside from those plot lines and characters, the movie brings in cops, lawyers, gangsters, widows, oil tycoons, and anything else you can think of. I remember watching the Humphrey Bogart movie the big sleep some years back, and my biggest complaint with it was that there were just too many characters, making it impossible to follow. The Two Jakes is the second movie that made me feel this way. Instead of a plot surrounding the corruption of water, like in Chinatown, it’s oil here. and like bringing in Evelyn Mulwray’s daughter, that also seems tacked on, just to have comparison points with the first film. I get that there was some blackmail over letting out mulwray family secrets and that that’s why mulwray sold her land, but how does that connect to Jake berman and lead him to kill his partner? The reason why this does feel like a sequel to Chinatown is because the seedy elements are there. Jack Nicholson plays the role as if he never left it. and I do like him going from place to place trying to make sense out of things. if only it were just a little easier to follow. there are no huge twists here like in the first movie and that’s a problem. those twists are in many ways what made that movie. their surprise and impact on an unexpecting audience. But there’s nothing like that here. In Chinatown, because there were fewer characters, we got to spend more time with them and got to know them. here, in The Two Jakes, that is an impossible task. there are just too many characters. in many ways this situation remind me of how get Shorty, a nice movie with a small handful of characters, turned into Be Cool, a sequel that was overloaded with different personalities. All of a sudden, for the sequel, they’re getting every actor under the sun. from Vince Vaughn to the rock to Uma Thurman to cedric the entertainer. Oh yeah, and Harvey Keitel was in it too. he can never be in the first movie, the one that does well, but just shows up for the sequel as one of many, many new faces. The Two Jakes was just too overloaded with characters and ideas. It became extremely challenging to follow and that’s not a fun time at the movies.